One of the most pleasant surprises in recent memory, David Walker takes Shaft - that bad mother-shutyomouth - back to his roots in one of Dynamite's best books. Shaft is a Vietnam vet recently returned home to a broken system and confronting crime and corruption on all sides, and the book isn't just exciting; it's also some of the smartest stuff on the shelves when it comes to racism in America. Keep an eye on this series. 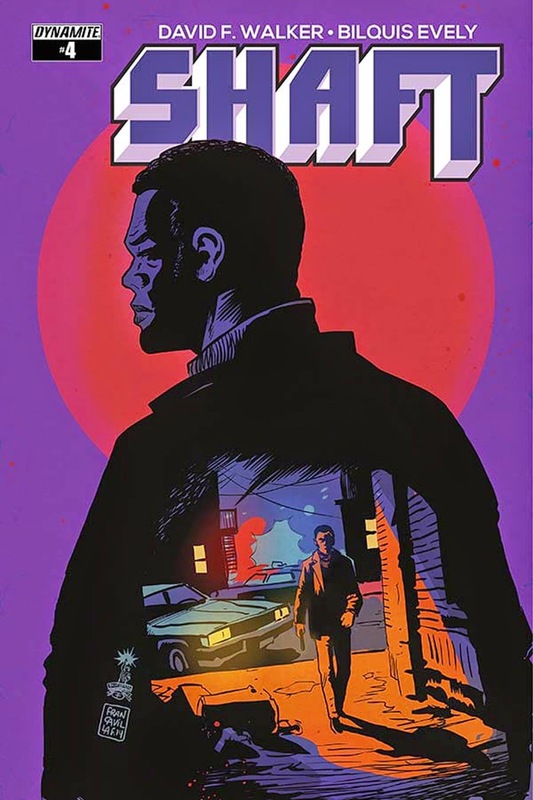 Smart, well-drawn, and with a gorgeous Franco Francavilla cover, Shaft is well worth checking out. 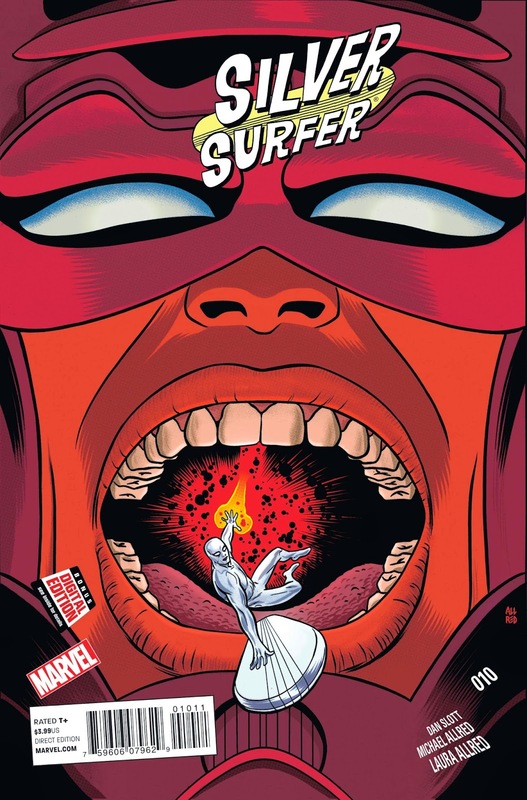 It's hard to make a better selling point than "Mike Allred draws Galactus," but here you go: Slott and Allred continue to make this one of the most fun books in Marvel's lineup. It's still got a very Doctor Who-esque tone, silly but with grand ideas, and it works extremely well for these characters. While it has traditionally only had 1-2 issue stories, this one is the 3rd in the most morally interesting arc yet, with Dawn having just found out that the Surfer is responsible for the deaths of millions of worlds. Last issue, he literally surfed a moon at Galactus in repentance...yes you read that right. Check it out! Becky Cloonan was always an artist whose work I loved, but she's fast making a name for herself as a fairly in-demand writer thanks in part to her work on Gotham Academy for DC. 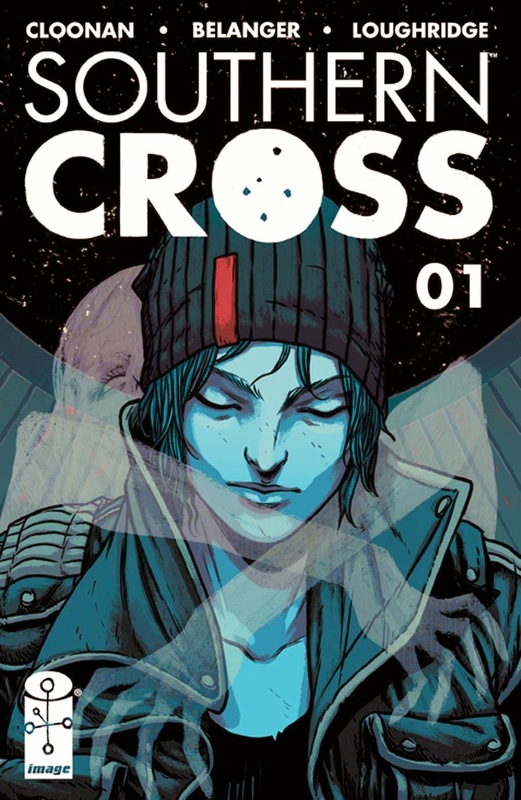 With Southern Cross, she returns to Image as a writer and teams up with artist Andy Belanger for an expansive sci-fi horror book. Alex's sister went missing on a routine trip to Titan, so now she's recreating those steps and seeing if she can find any word of what happened to her sister. But something is out there, outside the ship, watching her... and she may find herself in the same danger that ensnared her sister. While Kot has never seemed to thrive at Marvel or DC - I think he was on Suicide Squad for roughly 3 issues - he's been quietly doing some stellar work over at Image, and with The Surface, it looks like that trend is set to continue. 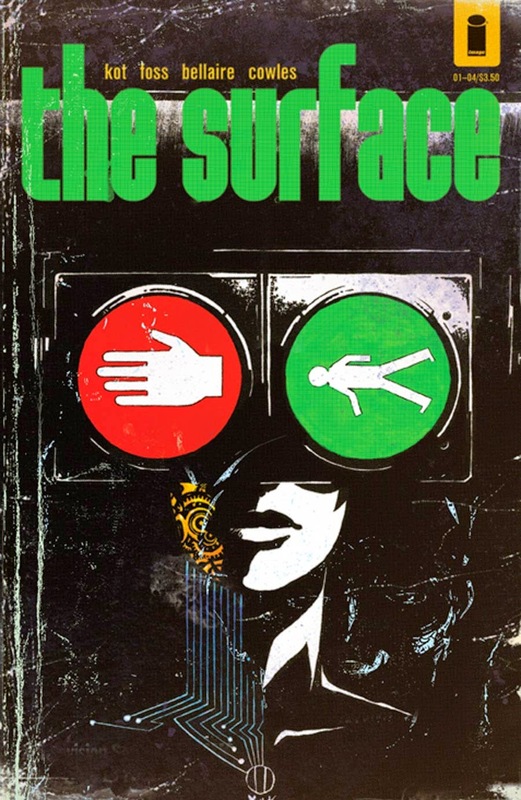 Kot, known for his ability to blend mind-bending premises with a fantastic thriller hook has done it again with The Surface, set in near-future Africa. The West and the East are all vying for control of various African nations while a trio of hackers are scouring Tanzania for a lot land that holds an incredible secret. Ales Kot going for a Moebius inspired tone and a dash of international intrigue. Whaddaya need, a road map? There are so many things I love about Aaron's newest volume of Thor, namely it's mysterious new hammer-holder. She's bold and badass, but has a charmingly nervous inner monologue. While the mystery of her identity has been mentioned, we've only ruled one person out so far as the story has focused on other things. 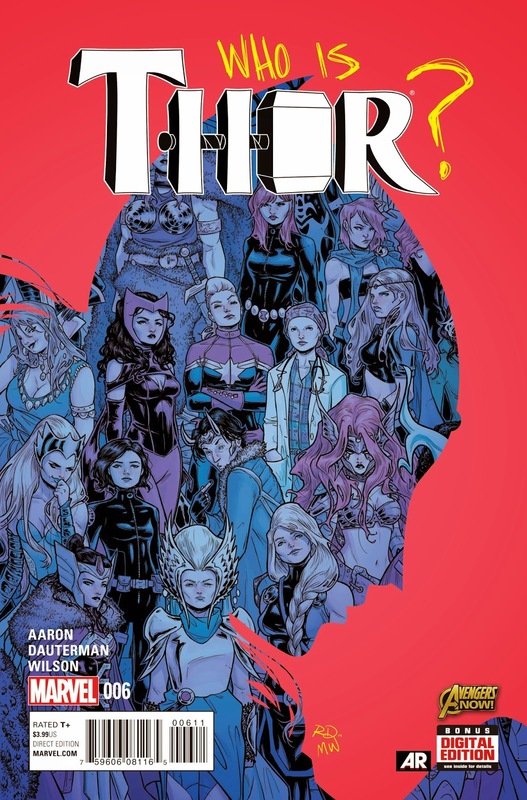 While I'm fascinated by the mystery and interested to see how it progresses with this issue, I'm just fine for now with the awesome Thor we've been treated to. 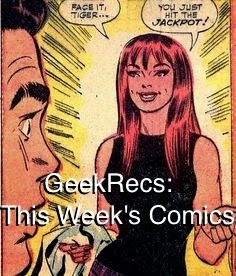 Aaron's unique brand of epic but silly has been on full display here, and to have Dauterman back after an issue off is definitely something to get excited about! DC's digital first titles have long been one of the strongest parts of their lineup in a sometimes dreary New 52 landscape. This last story from the Batman Beyond series is one of the strongest 'Beyond' stories I've read in a long time, and it incorporates many of the things that drew me to superhero comics in the first place, but namely alternate timelines galore! This story finds the Justice League of the future facing a possible invasion from the Justice Lords timeline. 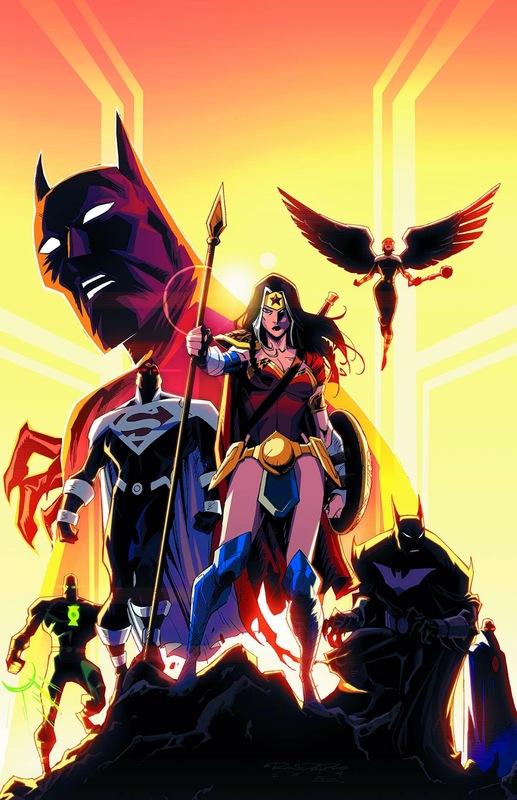 The Justice Lords, one of the best creations from the Justice League animated series, are essentially the Justice League gone wrong; sparked by one violent action, the team gradually (and somewhat understandably) turned into tyrants. Here we find their Wonder Woman in our own future, and while the team is obviously wary of her presence, they can't help but miss their own Wonder Woman. It's the best big superhero crossover that you probably didn't hear much about, but it was super fun and dramatic. This arc brings to a head most of the threads that both Beyond series started, and does it far better than Trinity War or Forever Evil did. If you enjoy the Beyond characters or the Justice League Animated Series, this one is worth your hard earned money!